Contact Jeff Kies Auto Sales Inc today for information on dozens of vehicles like this 2014 Chevrolet Cruze 2LT. This Chevrolet includes: AUDIO SYSTEM, CHEVROLET MYLINK RADIO AM/FM CD Player AM/FM Stereo Bluetooth Connection MP3 Player ATLANTIS BLUE METALLIC TRANSMISSION, 6-SPEED MANUAL WITH OVERDRIVE (STD) 6-Speed M/T M/T PREFERRED EQUIPMENT GROUP SEATS, FRONT BUCKET WITH RECLINING SEATBACKS AND ADJUSTABLE HEAD RESTRAINTS Bucket Seats STANDARD PAINT ENGINE, ECOTEC TURBO 1.4L VARIABLE VALVE TIMING DOHC 4-CYLINDER SEQUENTIAL MFI 4 Cylinder Engine Gasoline Fuel Turbocharged JET BLACK/BRICK, LEATHER-APPOINTED SEAT TRIM Leather Seats SUNROOF, POWER, SLIDING Generic Sun/Moonroof Sun/Moonroof *Note - For third party subscriptions or services, please contact the dealer for more information. * Drive home in your new pre-owned vehicle with the knowledge you're fully backed by the CARFAX Buyback Guarantee. This vehicle was engineered to be both economically and environmentally friendly with exceptional fuel efficiency. It's not often you find just the vehicle you are looking for AND with low mileage. This is your chance to take home a gently used and barely driven Chevrolet Cruze. Marked by excellent quality and features with unmistakable refined leather interior that added value and class to the Chevrolet Cruze Clean interior? How about flawless. This Chevrolet Cruze looks like has never been used. The Chevrolet Cruze 2LT is in a class on its own. So much so, that Chevrolet didn't miss a beat when they loaded this vehicle with an abundance of a-la-carte options. The Chevrolet CRUZE looks compact on the outside but is full of features on the inside that make it a driving favorite. Outfitted with a modern 4-cylinder turbocharged ECOTEC engine and six-speed manual or available automatic transmission, the Cruze drives smoothly and has both power and fuel efficiency. Choose the Cruze Turbo Diesel and take advantage of performance and efficiency that diesel provides. Safety features include Anti-Lock Brakes, a full ten airbags, electronic stability control, traction control, and the basic design features you see in larger vehicles. 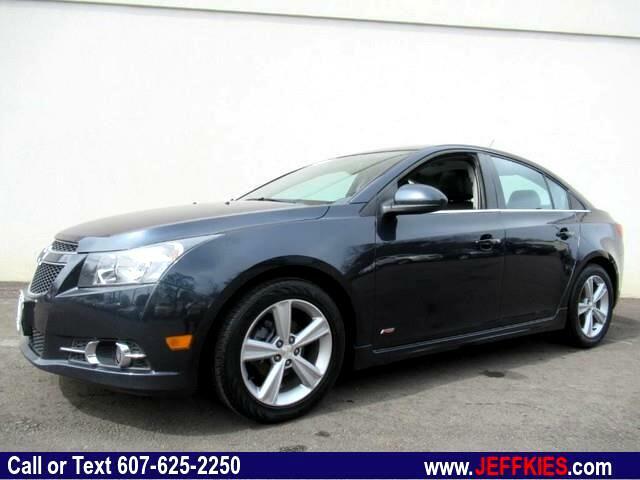 You can also take technology to the max with available Bluetooth, steering wheel audio control, and available OnStar. USB port and satellite radio cabability comes standard, and some trims include the touch-screen Chevrolet MyLink entertainment system onboard. Visit us for more information about all the features packed into this fuel efficient and fun to drive package!